'Rise of the Black Panther' review: A quality reimagining of one of Marvel's most popular characters – AiPT! Ryan Coogler’s Black Panther was beyond successful, almost instantly becoming a pop-culture icon, breaking box office records, and is now in the midst of Oscar talk. 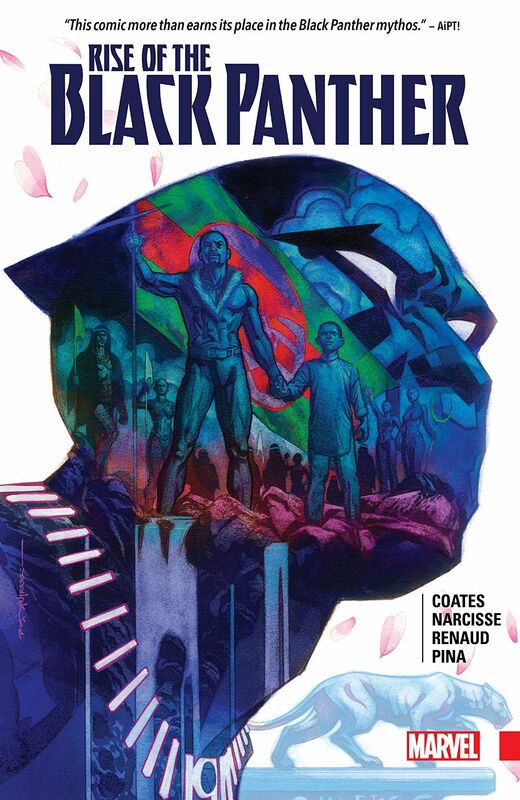 With that being said, I can’t think of anything more daunting than Evan Narcisse and Ta-Nehisi Coates’ task of creating another chapter in the Black Panther mythos that appeals to both the comic book fans and theatrical fans. That’s what they set out to do with Rise of the Black Panther. Rise of the Black Panther is a six issue self-contained story arc that reimagines both T’Challa’s rise to power and the unveiling of Wakanda to the rest of the world and its protectors. While Evan Narcisse helms the lead writing role, Ta-Hehisi Coates is credited as a consultant as this trade serves as the perfect prequel to Coates’ own Black Panther: A Nation Under Our Feet. Starting with T’Chaka’s first encounter with the outside world during his involvement with Captain America in WWII, the arc includes T’Challa assuming the role of Black Panther, his decision to announce Wakanda’s presence, and the inevitable fallout of that decision with both heroes and villains. This book serves as the perfect introduction for both new readers and those following Coates’ current run. The storyline doesn’t flow as well as others in Coates’ series, but it has quality writing and highlights everything we love about the character: the rich Wakanda culture, his stoic and authoritative disposition, and of course the amazing fighting sequences. Narcisse and Coates also include a multitude of guest characters in each issue which provides a source of constant anticipation and entertainment. The arc reveals a number of first encounters between Black Panther and the other Earth heroes as well as his history with Wakanda’s own characters such as Killmonger and The White Wolf. It’s storylines like these that you can’t find anywhere else. Coates really packs these issues with as much information and as much storyline as possible. So while its quantity is worth the price, the story itself does come off as a bit too wordy at times. Even with the amount of action depicted, the trade is a heavy read with a lot of historical recaps that I found myself glazing over at times. That’s not to say that the storyline wasn’t interesting, just that the writers tried packing in too much text per panel which also limited the variation in panel arrangement. Speaking of illustrators, this trade contains the work of several known artists including Paul Renaud and Javier Pina with Edgar Salazar and Keith Champagne collaborating on a single issue. Each artist brings their own style their issue, but all share the same color scheme which ties them all together. While I don’t care for the busy panel arrangement, especially inundated with text bubbles and captions, the actual art is quite good and both Renaud and Pina demonstrate their artistic versatility with dynamic poses and detailed attire. The trade also features the work of A Nation Under Our Feet illustrator Brian Stelfreeze for the beautiful cover art. Narcisse and consulting writer Coates do a fantastic job with a fresh take on the Black Panther mythos. With plenty of allusions to the original storyline and story arcs that should appeal to new readers and fans of the film, Rise of the Black Panther makes for a quality origin retelling for one of Marvel’s most popular characters. Coates and Narcisse create an entertaining new origin that captures Wakanda's history and T'Challa's rise to King.